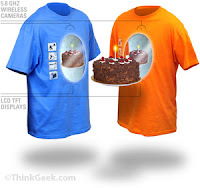 I'd make a "the cake is a lie" joke here, but instead, I will remind you not to get icing on your clothes...especially if you are wearing these portal t-shirts. At 100 bucks each, you'll want to keep them clean. But check it: each shirt has a camera and an LCD screen in it, and they transmit to each other. So it's like a real portal!! Except that you probably can't jump into your friend's abdomen and emerge from your own. Although that would be pretty cool. Probably the most geektastic novelty item of all time. PS - they make LCD screens that you can wear now?? What happened to rocket shoes?